Yesterday, at the Boston Celtics media day, 98.5's Rich Shertenlieb decided to brazenly ask The Question to the Celtics' newly re-acquired troublesome guard. "I'm gonna keep everything focused on basketball. But, you know, I come from an era where, you don't need to say nothing bad about no one's parents...so, not at all." 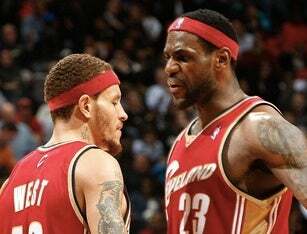 Here's the thing: Regardless of how preposterous the rumor sounds, it's become part of NBA lore and there are waaaay too many high-level NBA people and press who are noncommittal about what went down between Gloria James and Delonte. Something happened. Maybe not as lurid as the initial report, but I've been surprised at how many "respectable" people firmly believe "it didn't NOT happen." When is there going to be an HBO "Real Sports" episode about this whole ordeal?